The amount of the sailing boat accommodation fee includes the usage of the vessel, linen, towels set (2 per person). Obligatory payment: Tourist stay tax 1 Euro per person per day, Transit Log: 160 € for yachts up to 40ft, 220 € for yachts up to 50ft and over 50ft 250 €. 50% of the sailing boat accommodation fee 4 weeks prior to the departure period at the latest. The payment shall be made on the basis of the issued invoice, which Chilla Sailing directs to the Charterer without deferral upon the receipt of the booking inquiry. In order that the booking becomes final, the Charterer is to pay the down payment to the gyro account of Chilla Sailing or with the credit card, within 7 days since the day of the invoice, as well as to send the evidence of the down payment. All payments made by credit card will incur a 5% surcharge. The Charterer also undertakes to send the evidence of the rest payment of the total sailing boat accommodation fee. The fuel is not included in the sailing boat accommodation fee. The Charterer shall return the vessel with full fuel tank and water container. The vessel is to be clear, neat and dry, and its motor should be in working order. The security deposit has to be made by the Charterer when taking possession of the vessel. The deposit shall be refunded in its entirety upon the return of the vessel, unless the existence of a damage or a defect on the vessel or the equipment is found during the takeover of the vessel, and unless there are no claims filed or announced regarding the Charterer by the third persons, that are connected to the usage of the vessel. In case of loss of or damage on the equipment, particular parts of the vessel or the vessel itself, Chilla Sailing shall retain the amount (a part or the whole deposit), which corresponds to the value of repair, acquisition and / or purchasing the equipment or particular part of the vessel. In case the caused damage has the consequence that the vessel cannot be further chartered, Chilla Sailing has the right to retain the amount corresponding to the loss of profit. The damage caused by the oil deficiency in the motor is not covered by the insurance. The Charterer is responsible for returning the vessel at the time and place determined by this contract. For each calendar day of being overdue in returning the vessel, the Charterer agrees to pay Chilla Sailing a subsequent cost, equal to the triple daily sailing boat accommodation fee, by which the damage caused to Chilla Sailing by the impossibility of disposal of the vessel is compensated. If the overdue in returning of the vessel occurred due to particularly bad weather conditions, Chilla Sailing shall charge the Charterer the regular sailing boat accommodation fee increased by 50%. The notice to Chilla Sailing on the overdue caused by extremely bad weather conditions must be informed in written to Chilla Sailing. After taking the possession of the vessel, the Charterer shall bear all the costs of the daily berth in the port of putting in or in marina, costs of fuel, oil, water, cleansing and all other necessities, as well as eliminating all damages and defects, which can appear while the vessel is under Charterer's responsibility and which are not results of normal natural vessel consumption, provided the Charterer has previously reached an agreement with Chilla Sailing on technical justifiability of the repairs that are to be made. In case of damage or defect caused by the normal natural vessel consumption, the Charterer shall beforehand acquire the consent of Chilla Sailing for the repair of the vessel, regarding the price and the technical justifiability of the repairs that are to be made. The Charterer shall also acquire the corresponding invoice on the basis of which he shall settle his claim from Chilla Sailing after the expiry of the period for which the vessel had been chartered. If the Charterer, for every reason whatsoever, is unable to take the possession of the vessel, he can find another person who shall instead of him undertake all rights and obligations deriving from this contract. 50% of the amount of the sailing boat accommodation fee in case the Charterer should cancel 29 days before the beginning of the sailing boat accommodation. The total amount of the sailing boat accommodation fee in case the Charterer should cancel 28 to 0 days before the sailing boat accommodation, as well as after the beginning of the period for which the vessel was stipulated. For the damage caused by actions and failures of the Charterer for which Chilla Sailing is liable to the third party, the Charterer is obliged to settle the damages to Chilla Sailing in their entirety, whether it is the case of material and/or legal expenses that resulted from such actions and failures. The Charterer is explicitly liable for the vessel in case any official body confiscates it, due to inappropriate and illegal actions undertaken during the usage of the vessel within the period for which it was stipulated. The takeover of the vessel takes place on Saturdays at 5 p.m. and the return on Fridays 5 p.m. and checkout Saturdays by 8 a.m. The vessel must be returned in order and with full tanks to the Chilla Sailing base not later than the evening prior to the check-out day (till 8 p.m.). When taking the possession of the vessel, the Charterer is obliged to submit the evidence of payment of the whole amount of the sailing boat accommodation fee. 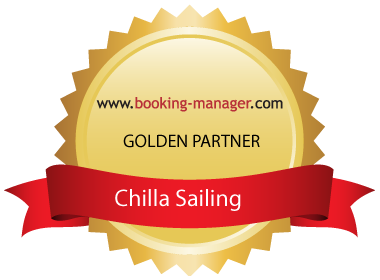 Chilla Sailing undertakes to deliver the vessel in working order and seaworthy. If Chilla Sailing for whatever reason does not place the vessel at Charterer's disposal at the agreed place and agreed time, the Charterer can demand the refund of the sailing boat accommodation fee for as many days as he could not have disposed of the vessel. The stipulated time of sailing boat accommodation duration can be extended by the Charterer for as much time as the takeover of the vessel was overdue on the part of Chilla Sailing, provided he has achieved previous agreement with Chilla Sailing in that regard. If Chilla Sailing cannot place the vessel at disposal at the agreed place 24 hours after the expiry of the time period for the takeover or if Chilla Sailing cannot place at disposal a vessel of similar or better characteristics, the Charterer has the right to desist from the contract and demand the total amount of the sailing boat accommodation fee or demand the amount of sailing boat accommodation fee for as many days as he could have not disposed of the vessel. All other rights to indemnification are excluded. The Charterer is obliged to check on the state of the vessel and equipment according to the inventory list. All possible objections have to be made before the beginning of the voyage. The defects and failures on the vessel and/or equipment that were not observed during the takeover do not authorize the Charterer to demand the reduction of the sailing boat accommodation fee. The insurance is determined by the terms defined by the insurer with which Chilla Sailing insured the vessel. The terms under which the vessel is insured form an integral part of this Instructions and terms of sailing boat accommodation and shall be delivered to the Charterer when taking over the vessel. The damage covered by the insurance and in accordance with the insurance policy, which has not been reported to Chilla Sailing without deferral, shall not be acknowledged. In case stated in the previous paragraph, the Charterer is personally liable for all the damages as the result of no reporting or late damage reporting. The set of sails is not insured. The Charterer shall bear the costs in all cases of sails damages, unless the damage occurred due to normal natural consumption and unless the sails were damages due to mast crack-up. The vessel crew is insured, as well as their personal luggage. The Charterer states that he possesses valid permits for vessel operating, that is, that a member of the crew who has relevant sailing permits shall operate the vessel (permits needs to be shown upon check-in at the base). The Charterer undertakes and states that he shall sail within the limits of the territorial sea of the Republic of Croatia (every exception requires special written approval by Chilla Sailing), that he shall not sub charter the vessel nor lend it to third person, that he shall not participate in regattas nor vessel races, that he shall not use the vessel in commercial purposes, nor for professional fishing, sailing school and similar, that he shall not operate the vessel under influence of alcohol or narcotics, that on the vessel shall not be more persons than envisaged for that vessel, that he shall sail only during safe weather conditions and good visibility. The Charterer undertakes to respect customs and other regulations and rules. He also undertakes that he shall not convey persons and goods for a fee, that he shall not sail in zones forbidden for sailing, that he shall carefully operate the vessel, its inventory and equipment and that he shall not be involved in towing of another vessel. In case of distress or accident, the Charterer shall register the course of events, as well as ask for the attestation by the harbormaster, physician or authorized body. Chilla Sailing shall be informed of the distress without deferral. The damages of the underwater part of the vessel have as a consequence the vessel inspection, the costs of which shall be met by the Charterer. The Charterer undertakes to inform the authorized bodies and Chilla Sailing in case of disappearance of the vessel, in case of impossibility of operating the vessel, as well in case of state organs or third persons seizing or confiscating the vessel or imposing measures of sailing prohibition. In case of non-compliance with the obligations stated in this chapter, the Charterer is personally responsible to Chilla Sailing and he assumes liability for all the consequences. The keeping of pets (dogs, cats, birds and similar) on the vessel is not allowed, unless a previous agreement was reached in that regard. Taking into consideration the weather conditions, the Charterer is obliged to reef the sails in due time and not to allow that the vessel sails under strain on the set of sails bigger than the one enabling pleasant sailing without excessive strain on ropes and canvas. The Charterer undertakes he shall not sail in the areas insufficiently known, considering the nautical charts which he has at disposal or if he does not carefully study nautical charts of a particular area in advance or other relevant materials at his disposal, that he shall not sail by night without using all navigational lights and without adequate observation from the board. When taking the possession of the vessel, the Charterer is obliged to inform Chilla Sailing on the approximate sailing direction (itinerary). The Charterer shall not leave the port or the anchorage if the wind force is or is expected to be more than 30 knots, or if the port authorities have forbidden the sailing. The Charterer shall not leave the port or the anchorage (unless a previous agreement was reached in that regard) until the damage is eliminated from any vital part of the vessel, such as motor, set of sails, ropes, bilge pump, anchor winch, navigational lights, mariner’s compass, safety equipment and similar or if any of the mentioned devices is not in working order. The Charterer shall not leave the port or the anchorage without sufficient fuel supply and when weather conditions or conditions of the vessel or his crew are unsafe or uncertain in general. Chilla Sailing (or its representative) can demand from the Charterer and his crew to prove their ability of operating the vessel and to demonstrate that ability at sea, with Chilla Sailing (or its representative) being present on the vessel during the test. If according to the opinion of Chilla Sailing, the Charterer’s knowledge is not satisfactory, Chilla Sailing can either terminate the contract without the obligation of refunding any amount or compensation of damages, or determine the sailor who will operate the vessel and who will be acceptable both to the Charterer and Chilla Sailing. The costs of the situation described in the previous paragraph shall be met by the Charterer, for as many days as it was necessary for the safety of the vessel or its passengers, the number of which days shall be determined by Chilla Sailing. Tests of Charterer’s ability to operate the vessel are an integral part of the time period for which the vessel was stipulated. In case of misunderstanding or dispute, the parties shall tend to settle it peacefully and consensually. If the misunderstanding or dispute is not solved in the afore-mentioned manner, the dispute passes into the jurisdiction of a court in Sibenik and is regulated by the legal provisions of the Republic of Croatia. The Lessee provides personal data voluntarily. The Lessee’s personal data are necessary in the realization process of the requested service. The same data will be used for further communication with the Lessee. Chilla Sailing obliges not to transfer the Lessee’s personal data out of the country nor forward it to the third person except for purposes of the realization of the wanted service. In case The Lessee’s signs the insurance policy her or his personal data will be forwarded to the insurance company for purposes of arranging Trip Cancellation Insurance, Medical Emergency Insurance, Lost and Damaged Baggage Insurance as well as Travel Medical Insurance. The Lessee’s personal data will be stored in the database, according to the decision of the Management concerning the collection, processing and storage of the personal data. The Lessee gives his or her consent that their personal data can be used for Chilla Sailing’s marketing purposes.